Last week I was guest of the Westminster University for their course Modeling on the Move in London. In addition to the seminar we did some cycling in the city. We went along some Cycle superhighway routes, but also along backstreet routes. It took me a train ride and a few days to collected my impressions of these three days in London. The first impression was that London still is a crazy city and even went behind other European cities. It has been 20 years since I was in London (as a tourist) and it has become more chaotic ever since. Not only the traffic, but also the concrete jungle of buildings, roads and bridges. Another impression is that cycling in London requires some serious courage. Changing directions is very hard, a right turn on a multi lane road is a risky challenge. On the other hand, some backstreet routes are excellent to cycle. Unfortunately, these routes are often difficult to find and don’t take you in a direct way to your destination. And most of these routes end at a barrier of busses, taxis and HGVs. 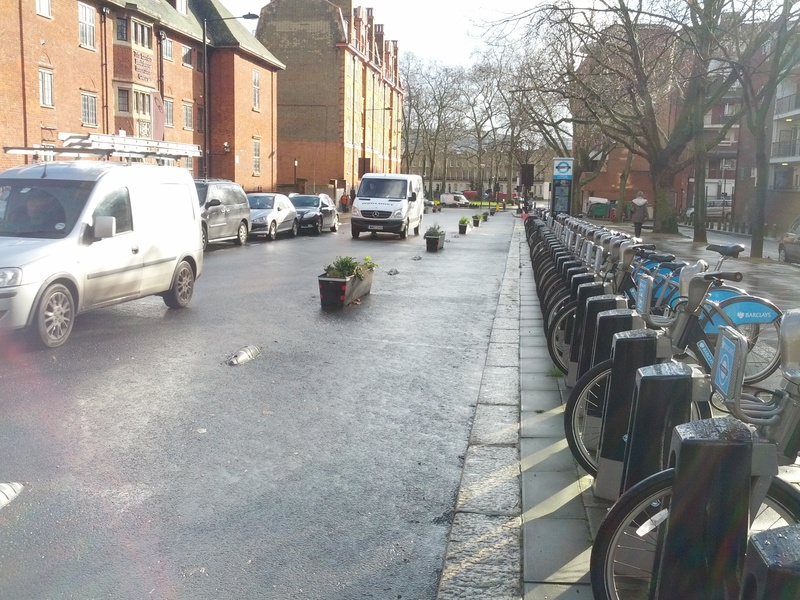 Another observation I had is that both London Cycling Campaign and Transport for London are doing the best they can to have more proper bicycle facilities. Having a background as an activist and now being an officer dealing with procedures in a political environment I know it is hard to change attitudes on such a large-scale as London with unwilling politicians. It is really challenging to make the connections between the cycling friendly islands in such a big city. It all started with a call by the Dutch Cycling Embassy for their members to attend at a workshop at the Radboud University in Nijmegen about bicycle modeling. As I am working on a bicycle transport model, this raised my attention. It turned out to be a workshop bout the forces behind encouraging more cycling and feedback loops. An interesting topic, we don’t have to deal that much with in the Netherlands. Later I was contacted by the organizers if I knew good examples of places where car use evaporated due to bicycle measurements. It would be an interesting side topic for their last seminar, as this evaporation isn’t anything that can be modeled by standard traffic models. 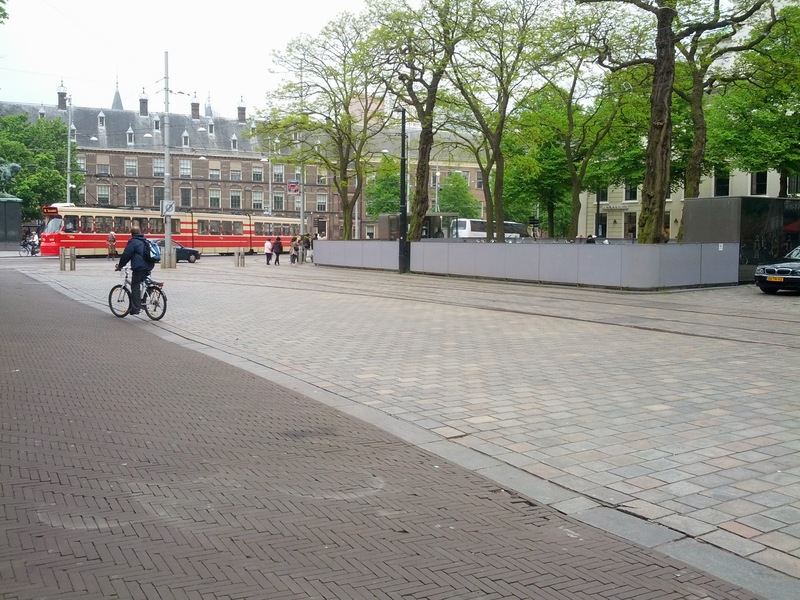 Of course we all know the traffic plan of Groningen of the late ’70s, but a more recent example is The Hague. I am grateful the city of The Hague allowed me to show their efforts to make the city a better place on the seminar. In this city the traffic flow was very bad, due to pedestranization of the main shopping street. Car traffic was searching for rat race connections trough the city centre and air quality turned very bad at some streets. Residents sued the authorities, and the city had to make plans to downsize the amount of trough going traffic in the city centre. Measures were planned by placing pollards and rising steps. These measures were highly controversial, but were finally executed in november 2009. Because of the controversy a lot of evaluation has been done. It turned out that the amount of traffic with destination to the centre was reduced and at the ring road became a bit more busy. Eliminating turns of traffic and adjusting traffic signals made it possible to increase the travel speed for cars. The amount of cyclists went up and the use of public transport increased. What is better, the turn-over of bars and restaurants increased and the level of vacancies of shops went less up than in other parts of the region and Netherlands. However it is hard to prove that these facts have a correlation with changes of the traffic circulation, it shows at least that the opponents fear was ungrounded. A link to the presentations of the seminar will follow. Most of the seminar was to explore and discuss modeling cycling in a better way. Also in the UK most of the bicycle transport models are extracted from car traffic models and don’t include the short rides within zones. Also the data collection is poor. Not only data collection from diaries, but also the counts to calibrate the models to the real world. And of course, who says that a model that describes the current situation is good in describing the future? As often mentioned before, in the end all models are wrong, but some are useful. Most important question is of course why we should want bicycle traffic being modeled. The most obvious reason is that in the world of spending money it is important to show which efforts your proposal will have and if the capacity of a road will be sufficient. Initially transport models didn’t have to be that accurate, but todays models are evolved in a more sophisticated way. As modeling is not my core business I won’t explain more of it, but bicycle modeling is more than one leg behind. I drew the conclusion that the modeling I am experimenting with is at least an interesting step in the right direction. When I have sound results I will publish more about it. I went out twice for exploring the city. Direct of the train I felt my thrown to the lions when I mounted a BorisBike and cycled my way in the bumpy and busy streets. The asphalt was often very bad and swerving in and out the car traffic was an attack at my nerves. Accompanied by an international group of students I gave my view on several traffic solutions on Cycle Superhighway 2. This is the worst implemented route, the highly criticized lick of paint is not enough to make it safe. And indeed, I didn’t feel comfortable, nor did I have the desire to bring my beloved family to London to cycle on this road. Of course we paid attention at the new installed traffic lights at Bow Roundabout, where as a coincidence the police started to enforce the light discipline. It is needless to say that the Dutch approach to traffic accidents and misbehaving road users is an elaborate inquiry of the situation. Environment friendly and cheap separation of bicycle lane. The second ride was, however wet, more pleasant. Brian Deegan of Transport for London hosted us and guided us trough traffic calmed streets, special traffic lights and small adjustments to make cycling comfortable. Unfortunately these pieces of infrastructure don’t make a coherent network yet, there is a lot of work to be done to make it ok for the average Dutch cyclist. 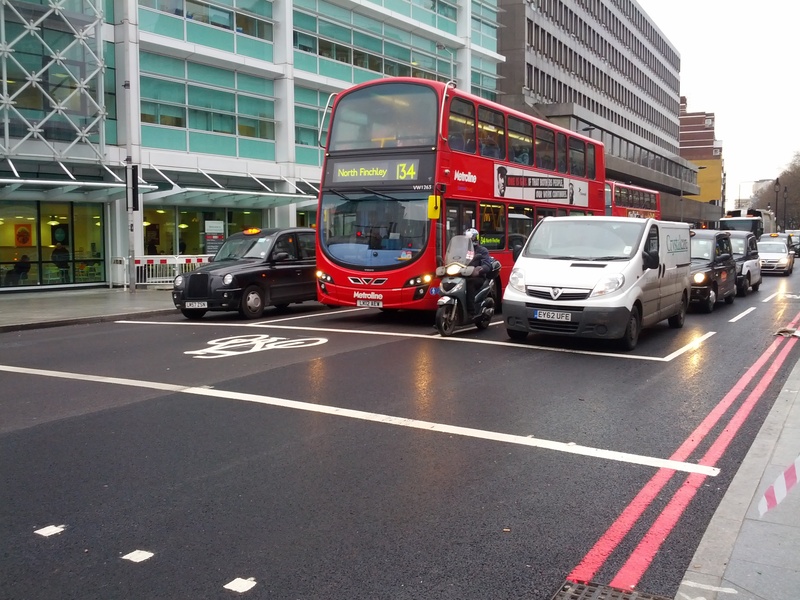 At least the nice islands show that TfL knows how to deal with bicycle traffic. Lack of political will to change the layout of the arterial roads is the main obstacle. I was shocked to see that these roads were mostly filled with empty cabs. I hope the Google Car can abandon this error. Back home I see the struggle London is making to adapt to modern times. As pointed out, I see progression at some stages, but I am afraid that a lot of water will flood through the Thames before cycling is really a mode of transport for everyone. 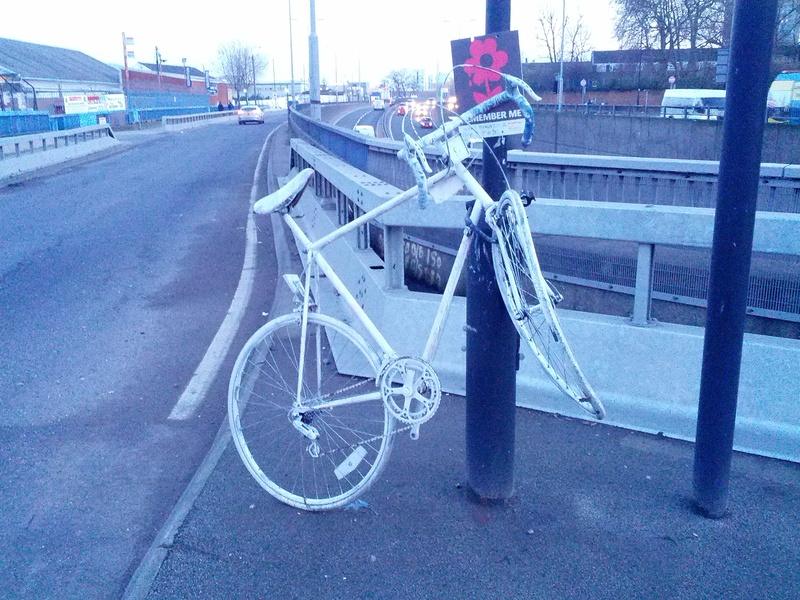 And finally it makes me sad that unnecessary deaths like at Bow Roundabout are the price Londoners have to pay to their stubborn politicians. The activists of London Cycling Campaign deserve our support to make their place better to live in. Interesting blog post, thanks Herbert. I think you’re being too generous about TfL. While there are certainly some people at TfL who are forward-thinking with regards to cycling, the organisation as a whole is still rooted in 1970s car-centric models, to the exclusion of all else. Unfortunately it is these oil-addicted dinosaurs who hold all the power at present. You are right that one swallow doesn’t make a summer, but in the end it is a political decision to have limited resources and staff specially for cycling. From my point of view I can see that the cycling staff knows which role to play.